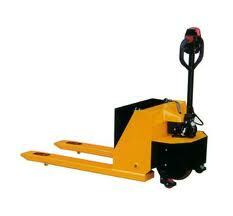 Semi Electric Pallet Truck Semi-Electric design provides functional benefits and lower cost. Forks are reised manual like a standard pallet truck. Battery powered DC traction drive system for effortlessly moving heavy loads. Handle includes forward/reverse throttle control levers and emergency stop button. Features: manual battery disconnect switch, batery charge level gauge, and on board 110V AC battery charger. Travel speed when loaded is 1.86 mph / unloaded 2.17 mph. Maximum grade is 4%. Specs: Uniform Cap. 2500 lbs, Overall Fork Width 25" x 48", Service Range 3.2" to 7.8", Overall Size 25-1/4" x 64-3/4" x 50-1/2".